Pete had a couple of other rockets with him, and we fired them all without losing any of them. His 15-year-old Phoenix model cracked the glue joint on one fin as it touched down a little awkwardly, but it's nothing that a little 90-second epoxy won't cure. The wind was intermittent, but when it was blowing it was blowing hard enough to be a hazard. 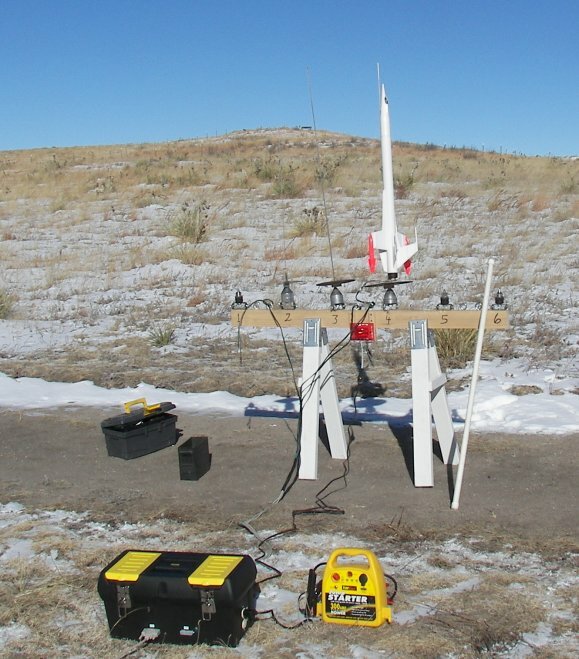 One of the other club members put an E-class engine in his rocket and may have hit 1,000 feet, after which the wind took the vehicle a long, long way. He jumped in his truck for the chase, and through binoculars we watched him scour a field across the road more than half a mile off. We got about a dozen launches in before pausing for some hot chocolate and homemade cookies with Tom and Eileen Preble, our very gracious hosts. Tom is that kind of guy you'd like to have behind the same tree as you; in addition to being an amateur astronomer and a private pilot, he built his passive solar house with his own hands. It was a toasty 72 degrees inside even though the nightly lows had been touching zero and they hadn't had the heat on in three days. Pete and I drove back to Colorado Springs marveling at how well it had all gone. I realized once I got out of the car again that after being fired, model rockets carry the unnmistakable whiff of black powder. (I myself hadn't fired a model rocket in thirty years and had completely forgotten...) The car is in the garage with the windows open, and I'm considering a gasket case for toting future vehicles to and from the launch range. You live and learn. December 28, 2007: Is It Singularity Yet? Every once in a while, I look around to see if the Singularity guys are still out there making noise, and shucky darns, they still are. I won't recap the whole Singularity thing, nor my primary objections; see my entry for August 28, 2004. But every couple of years, I feel obliged to demand that the Extropian crowd give us some examples of exponential progress. Computing? Hah. We're adding cores to CPUs without any idea how to use them. We have no idea how human intelligence works conceptually. (If we did we could emulate it. We can't.) We have no idea how the brain works. (So much for uploading it to a computer.) We are barely on the threshold of some real understanding of cellular processes. We have been using the Space Shuttle for 30 years, and are about to go back to a spacecraft that is basically the 45-year-old Apollo, with some marginal improvements. We can't perfect a scramjet to save our lives, nor a fully reusable SSTO launch system. A Drexler-style nanoassembler is nowhere in sight. (It may take another hundred years, and will require an almost complete understanding of those elusive cellular processes.) We have not extended lifespans, though we have improved the quality of life to some extent in the years 40-70. I've read in several places that the drug companies are hard-pressed to come up with new miracle drugs. Commercial fusion energy is still the same 25 years away that it was in 1970. Guys, show me any evidence at all of exponential progress. I will ask the question again in another three years. In the meantime, I'm wise to you, and life in 2007 still looks a lot more like life in 1950 than life in 1950 looked like life in 1900. This is not an exponential curve, and if you think it is, we need to talk a little about what "exponential" means. 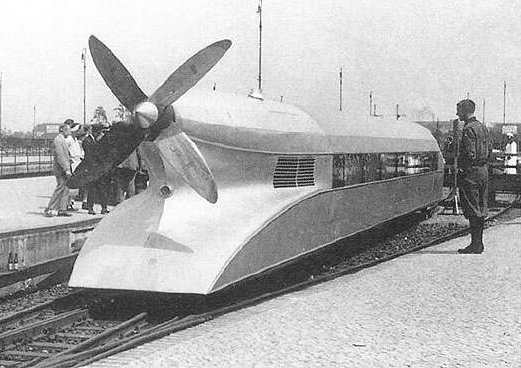 There is another nuclear waste car in the Lionel canon: The 6805 Atomic Waste Disposal Car (see above) which was sold in 1958-59, and worked with a small crane that I haven't found a good photo of yet. The little containers had red lights inside them, and when the batteries were fresh would glow ominously as they spun around the Christmas tree. Among the many gifts that Carol gave me yesterday, the best is probably a shredder that shreds CDs and credit cards as well as paper. I have a stack of old backup CDs awaiting proper destruction, and the device will be most useful. If you haven't already read it, I recommend Frederick Forsyth's The Shepherd, especially if you're into military aviation. Pete Albrecht gave me a copy for Christmas two years ago, and you can read it in an hour. I had not heard of the odd De Havilland Vampire fighter/bomber before reading it, and I now have a very good feel for what a fighter pilot's lot was like in peacetime 1957. It's a Christmas novella that some call a ghost story, but that's not quite fair; some heroes just don't allow little things like death to get in the way of their missions. Wired has an intriguing article about the effects of high-tech gadgetry on the housing market. Demand for existing (and especially older) houses is down in part because people really want home theater rooms and CAT5E in all the walls. If one of you Linux gurus could recommend a hard drive cloning utility running under Linux that would allow me to make a bit-copy of a hard drive (including the MBR) to a second blank drive, I would appreciate it, especially if it's free software. Christmas Day. Somewhere between those who cannot abide religion and those who cannot live without it is a group that doesn't get much press: Those who sense transcendence and are drawn to it, but who cannot frame a rational response to the impulse. "I'd love to have faith in God but I don't know how to do it!" is how one person put the problem to me. Others have freely admitted that they don't know what faith is or how it happens within a person. Is faith inborn? Can faith be learned? What are faith's limits? I know how they feel. I've struggled with the issue of faith for my entire life, and much of that struggle was and remains pure torment. I don't know for sure if faith can be learnedto be honest, it seems to be something you're born with in some measure, all of us scattered across a bell curve on the faith scale, as we are for so many other things. I think, however, that I can define faith, at least as it works for me: Faith is taking something seriously enough to act appropriately. Taking something seriously is the core of faith. If you're in the outfield and you believe that you have a chance of catching a pop fly ball, you'll start calculating its trajectory and moving toward it. If you don't take the game seriouslyor if you don't take your own ability seriouslyyou may just let someone else run for it. If you believe that an upcoming exam is going to be tough but unavoidable, you'll cracks the books and do what you can to improve your score. If you don't take the exam seriously, you may just blow it off. Saying, "I believe in God" doesn't mean much unless it changes the way you act. What changes those might be will vary with your culture and the way you think about God. It's possible to be interested in the divine as a concept, and in religion as a fascinating thread flowing down through human history, but if you don't somehow convert that interest into a system of guidelines for everyday action, it's just an interest without any least hint of faith. The flipside may be true as well. I find it fascinating that there are a great many people who will state flatly that they don't believe in God at all, but who nonetheless act in accordance with the universal principles espoused by all the major religions: Be honest, be truthful, be faithful to your spouse, do not engage in cruelty; and in general do unto others as you would have them do unto you. They would claim that they have no faith at all, but virtue is a decision, and whether or not we can fully explain how we came to that decision matters much less than simply getting there. Taking virtue seriously enough to be virtuous may not be religion, but it is definitely a sign of faithand if I were God, I think I'd grin and say, "Mission accomplished." There's much more to the issue of faith than that, but I'll let it rest for now. Carol and I wish you and your loved ones all the best in this Christmas season. Thanks for reading, thanks for your comments, and above all thanks for your friendship. Friendship is the best clue I've ever found indicating that God is real and at work in the world. Have friends. Take them seriously. All the rest will follow from that! Pete Albrecht drove out from Costa Mesa to spend Christmas with us, as he did two years ago, and of course when he's here we grant ourselves permission to be 14-year-olds again, at least with respect to toys. Our first stop was (as last time) Custom Railway Supply on Garden of the Gods Road, to pick up some Lionel track sections for this year's layout around the Christmas tree in the great room. On their used equipment shelf I spotted an interesting piece of rolling stock: a Lionel 6515-4 Reactor Fluid Transport Car, complete with an imaginary AEC insignia and the slightly puzzling legend, "When empty please return to the disposal site." Nonetheless, having been a highly contrarian fan of nuclear power for forty years now (since before ignorant condemnations of nuclear energy became a lefty fetish, in fact) it was an item I just had to have. The car is interesting in a lot of ways. The tank is made of transparent plastic, and contains a weird-looking purple-black pearlescent liquid that probably matches what most preteen boys hold as an image of radioactive waste. There's even a ball bearing rattling around inside it, to stir up whatever makes the fluid pearlescent again after the car sits in a box for a year between Christmases. (I'm guessing aluminum dust.) The trucks have working springs. After we put up our first shot at a layout, Pete and I celebrated nuclear power by putting my new nuclear tank car in the middle of a Pennsylvania Railroad passenger consist and running it around the tree for half an hour, shunting it onto a siding periodically to calm down all the hysterical imaginary passengers, who had booked on in Philadelphia for an anti-nuclear protest in San Fran. 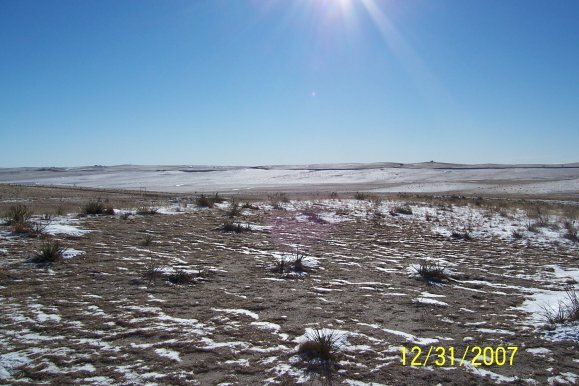 Half-past Wyoming we told them to love nuclear or walk home in the dark. So our very contrarian Christmas here is going precisely as planned. Carol is washing Aero, there's snow on Cheyenne Mountain, and God made Uranium too. All is well. 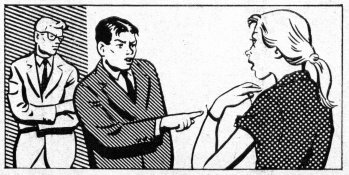 I just turned loose another Carl and Jerry free story, this one of particular interest, because one of Jerry's nearly always infallible techie plots is foiledby his girl-geek cousin Pat! Considering that the story originally appeared in December 1958, this is remarkable. John T. Frye was a man of his era, but he respected ability and education far more than he respected the social conventions of his time. Female electronics enthusiasts were very uncommon in 1958, but they existed, as evidenced by some of the ham radio "YLs"Young Ladies, of whatever agewho built their own rigs from loose parts and worked the world with them. The story is a hoot, and it's one of the reasons I'm glad I've put as much time into the series as I have. 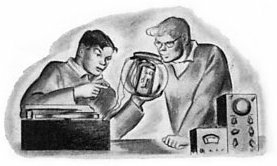 I had never read "Under the Mistletoe" before I began the Carl & Jerry project, because I never had any issues of Popular Electronics that old. Now that I've read them all (some of them many times while searching of typos) it's become clear that Frye had a much better opinion of women than most male engineers had in the Fifties. 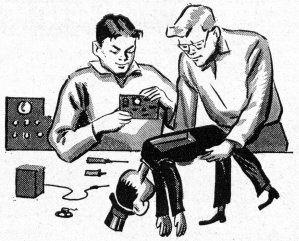 In later issues, once the boys went off to Parvoo University (a very thin disguise for Purdue) they quickly found engineering student girlfriends who somehow managed to master electronics without completely abandoning the 1950s image of young women. Mainstream SF was only beginning to appreciate women as equals of men in that era, but for Frye, it was just part of his unwavering conviction that if you know the tech, you're in the club, and nothing much else mattered. From the Who's Twisting That Poor Cat's Tail Dept: Saxaphone jazz covers of Christmas carols do not sound like Christmas. Nor do they sound like jazz. From the Carol and I Made the Right Decision Dept: Above the racket at the center of Chapel Hills Mall comes the plaintive cry at the very top of his four-year-old lungs: "Mommy, I have to PEEEEEEEEEEEEEE!" From the Some Things Man Was Not Meant to Know Dept: While trucking past Intimate Apparel in Dillard's (unless it was Macy's) I noticed a sign reading SALE ON SPECIALTY BRAS. Specialty? Are there Utility Bras? Ok, all right. Sorry I asked. From the Know Your Product Line...Please Dept: At Barnes & Noble at Chapel Hills, I was scanning the computer book shelves (at least it's still plural) when a sales associate whisked her way behind me, leading a confused-looking geek behind her. They stopped at the next case and she began furiously scanning titles, mumbling "Schneier, Schneier, Schneier...he's here somewhere..." Thirty seconds later she had still not found Applied Cryptography, so I leaned over silently and tapped my finger on the brilliant red spine. "Oh," she said, and handed the book to the waiting geek, who shook his head as she roared off again. "If you're buying that, buy Secrets and Lies too," I said. "You won't regret it." He did. And he won't. From the Earth is Not What It Used to Be Dept: Carol and I are shopping for globes. Woodley's Furniture had ten or twelve different models, but every single one was made of this faux mother-of-pearl crap, with a crudely shaped piece for each country. I complained about this to the smiling sales rep, who said, "Oh, well, you understand that we really sell them as accessories..." Postscript: All the gimbaled globes were top-heavy, with Antarctica facing up. Set them right with the North Pole up and they slowly sink back again. From the Frostbite Falls Fashion Flair Dept: Down at Citadel Mall, a gaggle of four junior-high girls, all in big bulky winter coats (some including fur-lined hoods) walked past barefoot, carrying their flip-flops in their hands. It was 38 degrees outside. Shop until you drop? Done, done. A little-noted but absolutely crucial divide in the ebook world hinges on the question of whether book pagesnumbered sequential blocks of text with a fixed formatare necessary, or even useful. I've been mulling this ever since I first loaded a Web page in late 1993 and watched it reflow text as I dragged the lower-right corner of the browser window around. Reflowing text stuck in my craw, in part because I was a magazine editor at that time, and magazine pages have very definite layouts. I've flip-flopped on the issue many times over the years, but I've recently come back to my original position: The page is essential. Ebooks need page structure so that we have a universal, human-readable notation for identifying a location in a large document. This location must apply identically to all editions of the same work, whether print or electronic. If the equation is on page 201 of a print book, it should be on page 201 of the ebook. This requires that the ebook have a page 201, and in a lot of modern ebook reader software, page numbers are dependent on font size, meaning that they're basically meaningless. The argument that text needs to be displayable on many different shapes and sizes of displays always seemed like a non-sequitur to me. Laying out a book into pages does not preclude reflowing the text in a window. I know enough about PDF internals to say with some confidence that a properly designed PDF viewer could render a PDF as reflowable text with page boundaries shown by a dotted line. All the information is there in the PDF; it's up to the viewer how the text is presented to the user. So all the seething arguments about page-oriented versus reflowable file formats is kind of ridiculous. It's not about the file format. It's about the viewer. I see no reason why the industry could not standardize on PDF documents and create special-purpose viewers for devices with small or otherwise nonstandard displays. Certainly, as a publisher I'd prefer to create just one single file format for a published work, supporting both print and electronic editions, and let the viewer software adapt to the limitations of the underlying hardware. Right now, ebooks are mostly fiction and purely textual nonfiction because our low-power portable displays aren't good enough to render complicated page images well. That's a temporary limitation. I think that within five to eight years we'll see letter-size tablets with full-color, 1200 DPI electrophoretic displays that can render a page image pretty much as well as paper. This will allow ebook editions of comics, kids' books, art books, and figure-intensive technical books without any compromise, and if you want to go crosseyed reading something like that on your cellphone, well, it's up to your software. Page images are the baseline. Subset the format however you prefer, and we'll all get what we want. Whew. I just got the last of the Christmas cards mailed, and posted our Christmas letter PDF here. I was testing a promising open-source media player app called Miro today, and it's one of the very few Win32 apps that has bugs under Windows 2000 that don't appear under Windows XP. It can't find its own icon under Win2K, and suffers random freezeups. On the other hand, it works fine under XP and plays every kind of media file I have without a burp. Greg Singleton is also running a contest for the most garish outdoor Christmas decorations in the country. Here's one that's not three miles from where I grew up in Chicago. That would be tough to beat, if for no better reason than they're just about out of front lawn. Mike Reith sends a pointer to as story about the guy who invented the video tombstone (like the ones at the end of Serenity) who, alas, has not yet sold a single one. What do I want for Christmas? How about a lump of ytterbium? All I need now is a 2 megacore yottaflop distributed processor and I could build a Hilbert stardrive! By sheer coincidence, I was asked a few days ago what sort of Christmas music I was listening to this year, just as I was massaging a playlist together for a mix disc I made for myself a few weeks back. So here it is: 23 Christmas songs from my personal Christmas music collection, which consists of about thirty CDs and ten or fifteen vinyl LPs. Most of this music can be purchased from Amazon or eBay as whole CDs; whether you can get it from the online music services is unclear. (I don't use them.) The "Great Songs of Christmas" vinyl LPs were remarkable anthologies given away by Goodyear dealers when you bought tires in the fall. The ones I have are the ones we got in the early 60s, but they were an annual thing from 1961 right into the early 70s. Firestone got into the same business a few years after Goodyear (and I have a couple of those) but they are nowhere near as good. Abundant and cheap on eBay, assuming you still have the hardware to play vinyl! All of this will fit on a single 80-minute CD-R. Let me know if you find playlists like this useful. I have others. Great hootenanny folker from some of the best voices and best harmonists of the past fifty years, best appreciated by those who were there when hootenanny folkers were first-run. I'm a thoroughgoing American mongrel, but there's enough Irish in me to appreciate this canonical performance from the soundtrack of White Christmas. Although corny and seriously bass-deprived, it was much beloved of my very South Side Irish grandmother Sade Genevieve Prendergast Duntemann (1892-1965) and I include it here in her memory. A sprightly version of the ancient hymn, without the words (which no one really understands anymore) to slow it down. Perhaps the single most powerful Christmas lyric ever written, culminating in that magnificent affirmation: "God is not dead nor doth He sleep." As a friend of mine once more crudely put it: "That's the kind of song that makes the Devil crap his pants every time he hears it." A superb Christmas song from a musical (Mame) that had nothing to do with Christmas! This obscure carol has in recent years come to be my second favorite, with its melody ("Cranham") by Gustav Holst and words by his friend Christina Rosetti. Good close harmony here. It never fails to bring a tear to my eye. What indeed could I possibly give back to God? Somehow computer books just don't seem to cut it. An arrangement of an ancient and slightly spooky Greek hymn attributed to St. Basil. The Orthodox are Catholics too, and for me this song sacramentally represents their concept of the Great Journey of Theosis, back to unity and wholeness in the Presence of God, where I believe against all denial that everyone and everything will eventually arrive. Did you know that holly wood burns like melting wax? Or that cherry wood will scent the room? This is a wood heat user guide that you can sing over a cup of mulled wine. Damned clever, those English. I don't know why, but this piece (which has no words) suggests for me the watch that little kids of Polish heritage keep for the First Star on Christmas Eve (as my sister and I did) when Vigilia begins, and beyond that all good things that are worth waiting for, no matter how much the waiting makes us ache. A choral version of perhaps my third-favorite Christmas carol, with rich harmony of a slightly odd sort, which is the trademark of this excellent group. "He Is Born" (French) in a piano medley with the Mary song we sang maybe a little too much back at Immaculate Conception grade school, especially in May. An odd combo, but it works. Chip Davis decided he wanted to write a classic Christmas carol. I wish I could pull off everything I try as well as he did. Two old French hymns done by a superb flutist in a medieval style. The slightly dumb lyrics are omitted, leaving a nice old melody about perhaps the least appreciated saint of all. "Stone my wife?" this muscular man asks the Pharisees, with pockets full of awls and chisels, a mallet in one hand and a razor-sharp saw in the other. "Just try it." The piano stars in this superb instrumental rendition of my third-favorite carol, with only a little occasional violin for backup. Deeply moving. Again, it's hard to say just why, but this instrumental piece sounds to me like an emblem of Hope, the most neglected of the Cardinal Virtues. Don't just light one candle. Light 'em allGod will give you as many as you needand the light will never go out. One unauthorized video of a house virtually dancing to this tune probably sold more albums for these guys than anything their label ever did for them. Although there are some hints of The Nutcracker here, I see a gigantic Niagara steam locomotive pounding its way heedlessly through a furious Rocky Mountain blizzard. You can't stop a 4-8-4not with something as simple as snow! And with that, I'll have to step up the pace on various Christmas things here. See you in a few. People regularly ask me, "How can you be a Catholic and be against the Pope?" It's an odd question but an understandable one. I am not against "the Pope," though I am very suspicious of idealists like John Paul II. (Irrespective of his nickname "The Grand Inquistor," I am much more at ease with pragmatist Benedict XVI.) What I am against is the whole concept of a Papacy that has evolved to give all authority within a global, billion-member church to one man, with the clear implication (if not always explicit statement) of infallibility. I am against the concept for a simple reason: It is a single point of failure for the entire Roman Catholic Church. Read enough history of the Roman Catholic Church from non-Church sources and you'll soon see what I mean. The early Church had a distributed system of government based on overseers ("bishops") in larger cities, who settled disputes by meeting periodically and hashing them out as a group. What we call "the Papacy" was originally nothing more than the office of the bishop supervising the Church in the city of Rome, and was a very different creature until well after the Roman Empire adopted Catholicism as its state religion in 313. Several of the earliest Popes, in fact, may not even exist; contemporary records are so poor that we may never really know, and the lesson we can take from them is that the Bishop of Rome was not considered anything special or different from any other bishop in any other city of that time. Power corrupted the bishops of Rome, who at first were considered (given Rome's status as the center of the Empire) "first among equals" by other bishops but not in any position of authority over them. The downward spiral of the Papacy through corruption and ultimately into chaos continued, hitting a low point around 1410, when there were three different people claiming to be Pope, all of them scoundrels who would probably be doing life terms if they lived today. (One of them was in fact a highwayman/pirate who was said not even to have believed in God.) We no longer elect pirates to the Papacy, but we have not reversed the sad situation that the Church is now an appendage of the Pope, and bad decisions made by one man without consultation can seriously alter the Catholic Faith. How this happened is a fiendishly complex and interesting (if perhaps depressing) business, and it took a lot of reading to get the whole story from enough different viewpoints to feel like I had something like objective history in hand. Several of the secular histories that I've read are decidedly polemic; as interesting as De Rosa's Vicars of Christ may be, its author is clearly grinding an axe the size of Sardinia. Chamberlin's The Bad Popes is better and much more objective, but is more biography than history, and does not speak in detail of the evolution of the institution of the papacy itself. I didn't find a book that really answered my questions until I bought a copy of The Pope and the Council, published in 1869, just before the opening of the First Vatican Council. Pope Pius IX had made no secret of the fact that he intended to declare Papal Infallibility an article of faith. 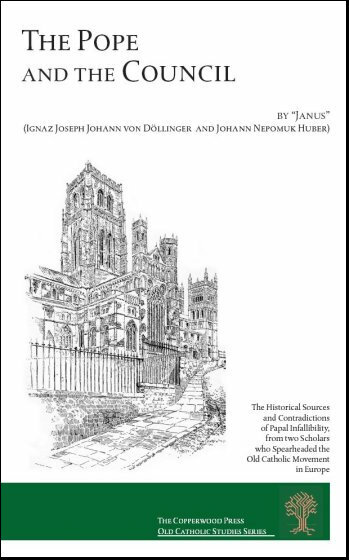 Two Roman Catholic theologians wrote and pseudonymously published (as "Janus") a long and heavily footnoted argument against Papal Infallibility and the general assumption by the Papal office of absolute authority not only over spiritual matters but also matters of secular government. One of the authors was the very formidable Johann Joseph Ignaz von Dollinger, who went on to lay the theological and eccelsiastical foundations for the European Old Catholic Church, from his excommunication in 1871 until his death in 1890. I recommend the book to anyone who takes such things seriously, but the book has been out of print since 1873, and when I bought it (2001) copies were very uncommon and extremely expensive. More copies are available online now, but you'll only rarely see one for less than $50, and you'll generally pay $75 and up for something that will leave crumblies in your hands as you read it and not survive a great deal of thumbing. So I did the obvious: I scanned my copy, OCRed the text, laid it out again, and am offering it on Lulu for $21.95. Note well: This is not an easy read. It was written by scholars for scholars, and was translated from the German on a very tight schedule. You may have to be clergy or a church geek like me to truly appreciate it. However, if you really want to know why I cannot accept Papal Infallibility, this is my answer. Buy it here. Softcover, 330 pages. $21.95. Many have asked which book I have from Dr. J. Allen Hynek's personal library (see yesterday's entry) and with only a little trepidation I'll admit that it's A. R. G. Owen's Can We Explain the Poltergeist? Hynek was interested in a lot of odd things, clearlyjust like me, heh. And alas, I have evidently misunderstood the "Ten Things..." meme (see my entry for December 7, 2007) as three of them are about other peopleIrwin Scollar and my parents. They have to be about me. So I've been asked for three more. Gotta think some but if I can find three more I'll post them here somewhere. You can download a VMWare Appliance thatmostlyemulates the OLPC XO. I had it running within a minute of getting it downloaded, but as with any custom hardware that differs significantly from a standard PC, some of its features work differently or not at all. There are a number of other "sub-sub notebooks" that the press has been positioning as competitors of the XO, including the Classmate from Intel and the EEE PC from Asus, but none of them has a convertible display. In other words, they are clamshells only. That's not the same species of machine. In my view, to be an acceptable ebook reader, a clamshell has to pivot into a tablet. This remarkable underground complex was dug in secret. Where the hell did they put all that dirt and broken rock? There is a word for "cutting large figures of horses into hillsides with spades." The word is "leucippotomy." Damn, there's a word for everything. By the way, an interesting way to kill some time with Google Earth is to search for Britain's hillside chalk figures by eye, beginning with the town they're near. (See the above point.) Those things are indeed big. I am allergic to the sap of balsam pines. Not life-threateningly so, but I get a rash when I touch them. I have a book in my library that once belonged to J. Allen Hynek and is autographed by him. One of my friends (Prof. Irwin Scollar) was mentioned in a Carl and Jerry story in 1964. My mother worked in ceramics. There is a cow skull on the high shelf here above my reference titles, wearing my Lane Tech mortarboard and tassel, along with the Chicago City Science Fair medal I won in 1970. On the shelf below the skull is a vertebra from a horse. The doctor who gave me all my childhood polio shots and other vaccinations (and they were legion!) was Dr. Pierce. My father had a pet alligator when he was in high school, and it ate the neighbor's cat. I have the ashes of three dogs (each in his own little plastic box) in our breakfront, right under the good china. I'm aware that we're into extreme trivia territory here, and so for me the meme really isn't that much fun. I know that a couple of my readers may know a couple of these things (Pete, that's you!) but I'm betting that no single person beyond my family knows more than three. Pullman is not specifically dealing with Roman Catholicism in the stories, neither in the story's politics nor in its metaphysics. The metaphysics are those of Gnostic Dualism, which teaches that a very nasty and powerfulbut hardly omnipotentbeing called the Demiurge created the physical world as a trap for spirits. The Demiurge has helpers called archons that are basically bad angels with names like Metatron. Pullman calls his Demiurge the Authority, but the Authority is not God as most people define Him. ("Killing God"what Pullman himself tells us the stories are aboutis an absurdity.) Gnostic dualism as a system of metaphysics was tossed out of Christianity over a thousand years ago, though bits of it still stick to our boots as Manichaeism. Close readers of Pullman's trilogy may remember that in Pullman's alternate universe, the Protestant Reformers conquered the Roman Catholic Church (instead of fighting it to a draw) and installed John Calvin as Pope. Calvin was a tyrannical megalomaniac, called (even during his own life) "the Pope of Geneva." Pullman's Magisterium is a reasonable guess at what sort of church a psychopath like Calvin would create, with the entire resources of the Roman Catholic Church at his disposal. Pullman has thus created a weird sort of fully imaginary Gnostic sacramental Calvinism as his heavy, and there is so little of genuine Catholicism left in it (some non-Catholic sects have nuns and bishops too) that the accusations of anti-Catholic bigotry are pointless. With that in mind, Pullman's anti-religion themes are misdirected to the point of silliness. Railing against Christian Gnosticism in 2007 is a lot like trying to organize a present-day protest rally against the Eisenhower Administrationthere wasn't a lot of material there to begin with, and hey, it's been over for a long time. Pullman is a superb writer. The first two books were dazzlingly well done as fantastic literature, and if you decide to read them you should stop there: The third book, The Amber Spyglass, was a total botch, and basically ruins everything the first two books so carefully establish. Interestingly, it's The Amber Spyglass where most of the polemic takes place. I wonder if Pullman got "anti-religion" while working on the first two books and didn't fully express it until the third, when he felt he could get away with it. If so, it looks like the sort of self-indulgence trap that a lot of writers fall into once they become successful. Railing about religion is the least of it. What really troubles me about His Dark Materials is that it is, in fact, so dark: There is a grimness to the whole business and a casual disregard for human life that was repellent enough to temper my early enthusiasm for the concepts and the writing. The trilogy contains absolutely no joy and nothing like triumph, and at the end of the third volume a huge squirming mass of mismatched pain-soaked themes and metaphysical loose ends descends into terminal incoherence. I wouldn't give it to my own children, that's for sureat least not until I was absolutely sure that they understood that cynicism is cowardice, and that they had the courage to make their own decisions as to whether life is meaningful or not, rather than take some tenured cynic's word for it. I will probably see the film, even though the trailers seem dark and muddy and singularly unimaginative. If that's the best they can muster in terms of preview, I'm not sure that New Line Cinema will make their $180M back. I'm also not sure that anybody can see the CGI polar bears and not think of Coca Cola's mascots of several years ago. Above all, the story must present some sort of tech concept in a way that helps people understand how it works. People who followed Carl and Jerry when they were first-run will know precisely what this means; if you're much younger than I and unfamiliar with them, please download and read some of the free stories (all PDFs in the 1.5 - 3 MB size range) from my Carl and Jerry page. This is a paying market, though it won't make you rich and I don't think it will get you into SFWA. I'm buying first rights only, and paying something somewhere south of $80; how much south depends on how much work I have to put into it to make it publishable. Again, we're talking a POD book with lifetime sales potential in the low (or maybe mid) hundreds, so there's not a lot of money on the table. It really is fanfic. The new stories will need illos; again, done in a style that respects the original period art without necessarily duplicating it. I don't know how many artists I have in my readership (my stats tell me I get 12,000 - 15,000 unique visitors per month, excluding LiveJournal, so I hope there are some) but if you're interested, there are illos in the free stories to give you a sense for what I mean. The artists and art styles varied broadly over the series' 10 years; some of the art is realistic, and some borders on cartoons. The approach matters less than skill in execution. Again, I'm paying for the art, but I'm not sure how much yet. When I first heard about One Laptop Per Child I was dismissivewhat third-world kids really need are things like clean water and freedom from bloodthirsty governmentsbut I've since changed my mind for several reasons. The best way to reform autocratic societies is to educate their women, and the earlier you start, the better. That's a whole separate topic, and not one I feel like getting into right now or possibly ever. No, the real magic of OLPC is the way its contributors have gone back and re-thought much of what we assume about personal computing, and in particular about portable computing. Latop computing is in a bad place right now. My 2001-era Thinkpad X21 runs at 750 MHz. My 2006-era Thinkpad X41 runs at 1.5 GHzand seems to be only half as fast. Ponderous file access, constantly stuttering mouse pointer, poky screen refresh, well, what else should I say? (And those were problems right out of the box!) My brother-in-law's hunky new Vista laptop is twice as heavy, just as poky, and felt like it would set my pants on fire. It's time to throw it all out and challenge a few basic assumptions, the first of which is that a portable machine must be capable of doing anything a desktop can do. Nuts to that. The essence of portability is size, weight, and battery life. Engineers should take that as a given, and see what can be done with it. Don't start by assuming Office 2007 or some massively animated video game as normative and then shooting as high with the hardware as you can. That makes both the hardware and the software look bad. Laptops should not run Windows or OS/X. They should run an OS that is tuned to do the most necessary things in an energy-efficient way. This is the smartphone philosophy of design, used because there is no choicea smartphone can't sit there and continuously slurp 25W from a battery the size of a CF card. Data compatibility matters much more than software compatibility; that is, a portable should be able to render and manipulate Office files but not necessarily run Office itself. Much of our software is designed by people I call "feature creeps" who (in fairness to them) are driven as much by imperatives from corporate finance (and the tyrrany of the "pip chart") as they are by any passion for creating new things. They assume that next year's PC hardware will make up for this year's cycle hogs, and for a long time that was true. It hasn't been true for two or three years now, and that's why our laptops seem so slow. 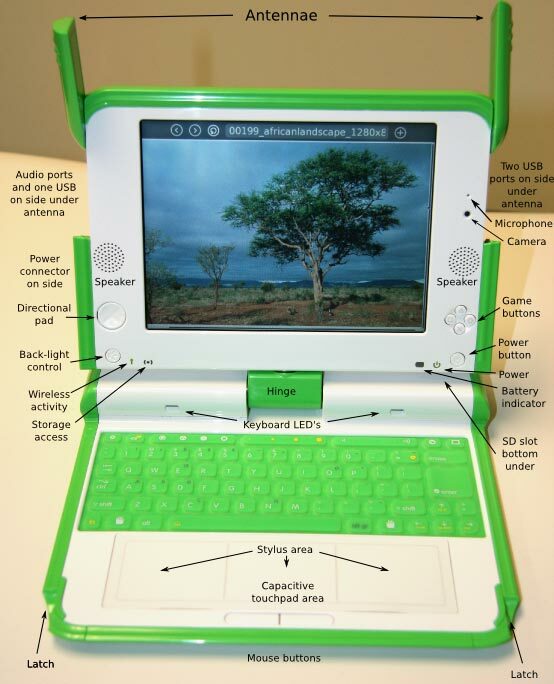 The brilliance of the OLPC XO device is that its engineers literally went back to a blank slate and started over. Gone is the bulky, heavy, fragile hard drive, replaced by a tiny SDHC solid-state drive, plus an SDHC slot for a second card. SDHC cards hit 16GB this past fall, and I still use a Thinkpad X21 laptop that has only a single 20 GB hard driveof which 6 GB are still free. (I laid out a whole book on that machine!) The XO's AMD Geode CPU runs at 433 MHz, which is actually fast enough to do a lot of things if your OS isn't eating most of your cycles. (My 2001-era Thinkpad X21 only runs at 750 MHz.) Its power-management intelligence is radical. The Geode processor can turn huge chunks of itself dead off when not needed, and so in monochrome ebook mode (no backlight) the XO draws just half a watt. (In full functional computer mode the XO draws about two watts, with about half of that going to the backlit display.) The display spins around and allows the device to work in either laptop mode or tablet mode. (Alas, the first-gen XO does not have a touchscreen or stylus input. I can only hope that future generations will.) The OS is a custom fork of Fedora Linux optimized for both low-power operation and kid-friendliness. It's not standard Linux, and that's a good thing. Ubuntu is more efficient than Windows, but it's not efficient enough to run on something constrained to 2 watts or less power consumption. The XO went into mass production in November, and Third World governments have begun ordering hundreds of thousands of them for use in rural schools. Getting the cost down from $200 to $100 has been a problem, but if they would just open the market up to First World consumers, they'd be making them by the tens of millions and the cost would plummet. Go figure. (Americans can currently by them only by buying two, and sending one to a Third-World child.) Supposedly the design is open-source, so if some other manufacturer wants to make a version for the West, I'm guessing it's at least possible, if not necessarily as cheap as the true OLPC device. What I'm hoping is that the design will prove out that a laptop doesn't have to run Vista to be useful. I'm especially fascinated by the XO as an ebook reader. Even this early in its price curve it's half the cost of a Kindle, and does a lot more. (You can program it in Python!) So I'm watching it closely. I may even order one under GOGO. If I do, I'll report here. Meditative reading is reading to change your state of mind. "Reading for pleasure" is most of this, but there are other kinds. People read to inspire themselves, to laugh, or just to think of something other than what's going on around them. I read dullish history books at the end of the day to make myself sleepy. There is also the use of the written word as a kind of spiritual mantra; in Christianity this is called lectio divina, in which the act of reading itself, independently of what is read, is treated as a kind of prayer. Autodidactive reading is reading to teach yourself something. It requires deep attention, and for best results, the taking of notes or outlines. This may involve reading entire books sequentially, but in many cases it involves reading portions of several or many books with some kind of topical relation. The overall goal is understanding, skill-building, or decision support. Most tech people read intensely to solve problems. It can certainly be fun, but it can also be torment. Developmental reading is reading within the process of creating texts for reading or presentation. It's what people in publishing do, and I do it a lot. It includes developmental editing, copy editing, proofreading, and indexing. It also includes the sort of reading that supports writing, as of research papers, documentation, or course materials. Most people who now read ebooks regularly are meditative readers, and most of that is reading for pleasure. We're starting to see ebook use in autodidactive reading, but there's remarkable resistance to the concept, even (or perhaps especially) in the tech industry. Economic pressures eliminated printed manuals from software products, and most tech people mourn that a little, perhaps because tech vendors, for whatever reason, used to spend more effort on printed manuals than they now do on online help. Also, the kind of extreme focus that autodidactive reading often requires clashes with computer displays. This is why I generally proof printed copies rather than on-screen files, especially for book-length works. As displays get better and user interfaces mature and standardize, things will improve. In the meantime, we need to understand that not all readers serve all kinds of reading, and we need to think a lot harder about what we are actually trying to do (and how we go about doing it) each time we crack a book.